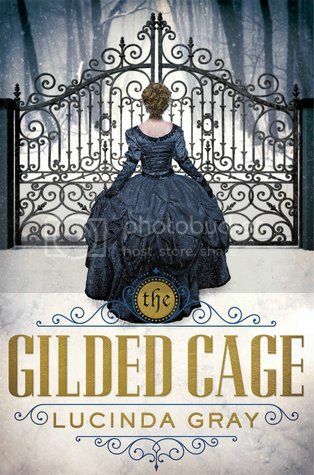 The very first thing that drew me in to The Gilded Cage by Lucinda Gray was it's absolutely stunning cover. I'll admit it, I can't resist a book with such a gorgeous cover. Then I started the story, and was immediately hooked by that as well! The main character in the story, Katherine, was super easy to like. She spent her whole life growing up in Virginia and was well able to take care of herself when she gained an inheritance and moved to England. You'd think one would have a hard time fitting in in this situation, but she did so perfectly. And when everything started going wrong, she kept her head the whole time, even when people tried to prove that she was crazy. I really enjoyed Katherine as a character! The storyline for the book was very mysterious, and at times, a little creepy, which I absolutely loved. I loved the time period for the story as well, as it just made the storyline so much more interesting, and of course, made the mystery factor even more mysterious. I also liked that this book was a really quick read, coming in at just 245 pages, I had the book read in no time! Overall; The Gilded Cage is the first book I've read by Lucinda Gray, but it definitely won't be the last! This story had me hooked, I enjoyed so much about it, and I'm really looking forward to reading more by Gray in the future! Short and good read. And that cover really is beautiful. And it's so great to know that the historical aspect of the story made you like it even more. I'm not eyeing this book now. Great review!